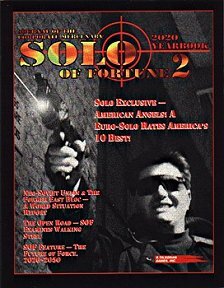 Another delightful in-character magazine-style source book, this one aimed at enhancing the Solo character role to something a bit more than a thug with a gun. Its content includes historical articles, ideas for improving your effectiveness and loads of reviews and adverts for equipment - weapons, of course, but other stuff a passing Solo may find of use or interest as well. It starts with a Letters Page, with complaints from readers that their favourite weapon (whatever that is) has been neglected by the magazine's reviewers. Next comes an account of the 16th Annual SOF Invitational IPSC Shootout, which provides plenty of ideas for how to engage in gun combat as you read through; and an article on Weapons Customisation, should you be short of ideas about that. A report on a gun show presents several new weapons with their game stats carefully tucked away in the sort of technical detail a gun bunny looks for. A Future of Force is a look at the current and potential development in large and small scale conflicts. Small scale is defined as extractions and tactical operations, large scale are more the purview of mercenary units. Packed with historical analysis, this fascinating article breaks down the various types of operation that can be conducted. Ideal if you are planning one as Referee, useful even for the players who will have to contend with it, with good definitions of terminology. Next up is a combat vehicle review, and tucked away in the corner is an adventure hook (if you haven't had a few ideas spawn already). More weapons and armour follow... Another article, The Future of Force, outlines a load of potential job opportunities for a gun-for-hire (again spawning plenty adventure ideas, of course!). It also covers how other Roles can be included in your military-oriented schemes. Trips to the range, an article on archery, and tales of working visits to exotic locales - including an unidentified probably equatorial South America and Moscow - give wonderful local colour as well as an entertaining read. Indeed, there's a lot about the Soviets (as you'll recall, the Iron Curtain didn't fall in this timeline) and their weapons, equipment... and problems that might require armed force to solve. Just when you are maxed out on the hardware, there comes an article making sense of the effect of (too much) cyberware on its owner, along with notes about how to use it to prevent players going overboard with cybered characters. Then there's a review of a training range that sounds great fun to visit. If your characters don't feel they're getting enough action, there's a competitive scoring system, why not let them have a go? And finally, there's some recruiting ads. A thoroughly entertaining read even if you are not the most combat-oriented person, with masses of ideas (and gear) to keep any Solo happy. Return to Solo of Fortune 2 page.